Are you as ready as I am? The Cities Circle Bag Crochet Along officially starts HERE! Well, I suppose it started with the CAL announcement so if you are landing here for the first time, you’ll want to check out The Cities Circle Bag Crochet Along before getting started. 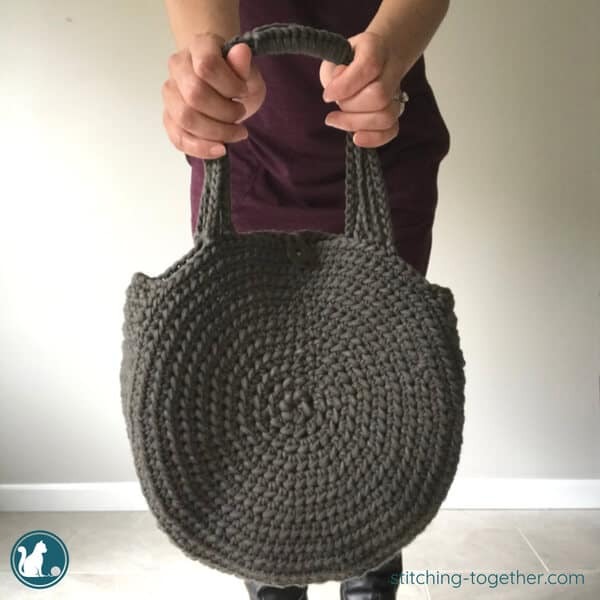 I am so excited to make this trendy crochet circle bag with you! If you haven’t joined the Stitching Together Crochet Community on Facebook, now would be a great time to do it! I cannot wait to see all your progress and finished shots as we work on this bag together. Even after the CAL is over, I am looking forward to continuing to interact with you in the group and to grow together as crocheters! 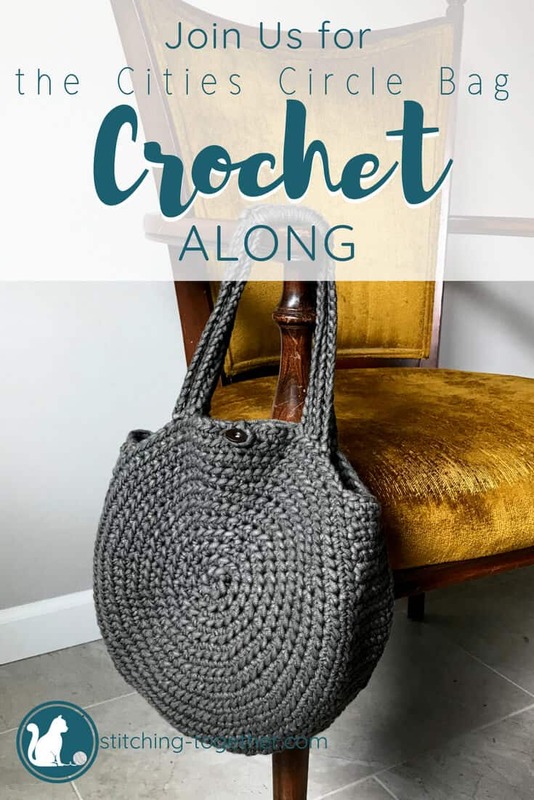 Part 1 of the Crochet Circle Bag pattern is below so scroll on down to get started OR if you are like me and have trouble waiting, you can purchase and ad-free PDF of the ENTIRE pattern today! In this section, you’ll be making the two sides of the bag, or does it make more sense to call them the front and back? Either way, you’ll be working on the round parts and the largest part of the CAL to accomplish. If you’ve crocheted circles before, you know that they can sometimes turn out to look more like stop signs than circles. I’ve found that to be the case even more so when working with chunky or bulky yarn. As you go through the pattern to make the sides, you’ll notice that the increases are not in the same place in each round. This ensures you get that nice round and smooth circle! It requires more attention to the pattern instead of a normally increasing circle, but the outcome is well worth the extra care. 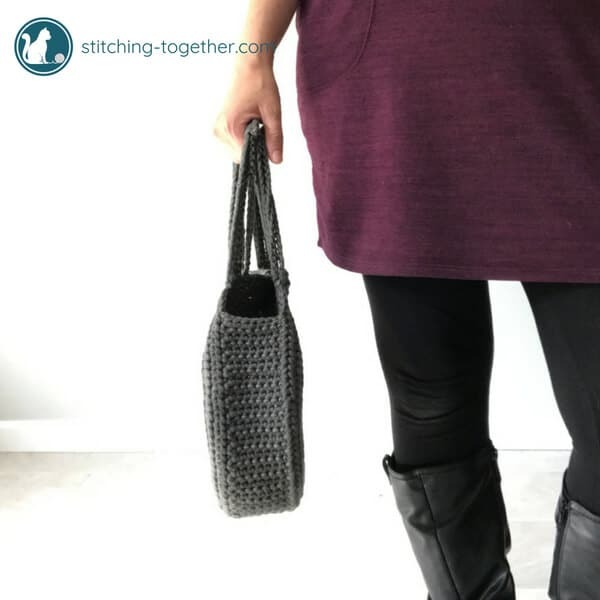 See the Cities Circle Bag Crochet Along post for the materials list. The wrong side (side with the extra loop from the hdc) of the circles will be the outsides of the bag. If your circle aren’t laying flat, doing a light blocking with some puffs of steam, while carefully smoothing them out should do the trick. If you are using the steam function on an iron, be sure not to touch the yarn as you don’t want to melt it! Please tag me on social using #stitchingtog – I love to see your finished projects! Repeat making the second side – do not tie off second side. Stay tuned for Part two of the Cities Circle Bag CAL where we join the sides! « New Crochet Pattern Bundle – All About the Layers! Glad to see this one. Will definitely make this one for my girls 🙂 Thanks Jess! I just came across you blog and decided to join your crochet along!”I’m super excited! I will try my bestvto get caught up over this 4 day weekend! Thank you for hosting and sharing your beautiful pattern! Do you think t-shirt yarn would work? I cant find the grey you suggest. I do think it will work! 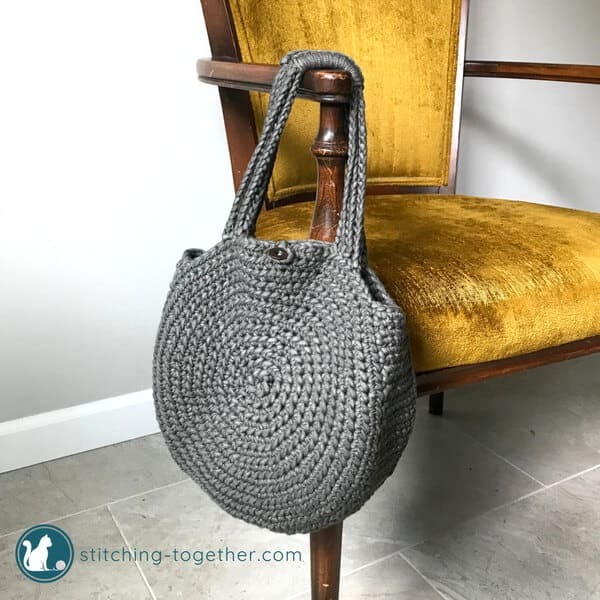 Thanks for this… I just finished the second circle last night and proud that I’m keeping up with this CAL- I often fall behind and leave an unfinished WIP, but this is such a beautiful, simple, and practical design that I just had to try. Will post pics on the FB group! Thank you!! Cristina, I am so glad you’ve joined us and are able to keep up!